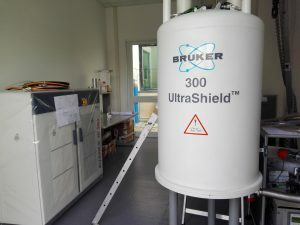 The Avance NMR spectrometer provides a wide-bore superconducting magnet operating at 7 T, with active shielding UltraShieldTM technology. The system is equipped with dedicated micro-MRI probes (5, 15, 30 mm volume coils and surface coil for 1H, 1H-13C dual tuned 10 mm volume coil) for high resolution imaging and spectroscopy of in-vitro, ex-vivo samples and for mice in vivo. The spectrometer provides both 1H/19F channel and X nuclei channel operating in the range 6-365 MHz. The application packages include Cardio, diffusion (DWI protocols), angiography (DCE-MRI protocols), perfusion ASL, fast echo time (UTE/ZTE protocols), relaxation (T1 and T2), single voxel spectroscopy and spectroscopic imaging. Breath- and hearth-rate gating is available for in vivo studies.